Imagine – In Just 7 Days Taking Back Control of Your Life! My name is Nicola and I suffered from panic attacks for nearly 20 years. They started in 1979 at a time when there wasn’t even a name for the agony I was going through. You know what I’m talking about, sheer terror out of the blue, heart palpitations that seem to rip your chest apart, uncontrollable fearful thoughts and a body that turns to jelly and just freezes while your mind is screaming to get you out of there. I	felt	I'd lost control of my body and my whole life. I was devastated. In the end I just stayed in all the time. For a while I didn’t even get out of bed. Life	just became unbearable. It's called EFT, or Emotional Freedom Techniques, now more commonly known as simply, tapping. EFT is based on tapping Chinese acupuncture points. I too was pretty sceptical at first though it was SO EASY and QUICK to do I thought I'd give it a go, and within 7 days I was completely panic attack free. That was over 19 years ago, when it was still relatively new. A randomised controlled trial conducted by Dr. Dawson Church and his team found that cortisol levels drop by as much as 50% after an hour of EFT with no significant drop for those who had undergone an hour of traditional talk therapy. In Dr. Church's Stress Project he reports a 63% decrease in PTSD symptoms after just 6 rounds of tapping. That is a staggering result! Experts, psychologists, doctors, dentists and celebrities all over the world are now taking notice of EFT's amazing results. Even royalty, the Duchess of Cambridge used EFT to overcome her fear of flying. And the beauty is, because EFT eliminates negative emotions, once you are free of your panic attacks and anxiety, you can use it for all sorts of other things. You can use EFT to lose weight, reduce pain, get rid of the fear of public speaking and even remove blocks to abundance. I've helped many people overcome all of these things simply by getting rid of the negative thoughts and emotions behind them all. your panic attacks. No courage needed. In my ebook Life Without Panic Attacks you will get clear step by step instructions written in short chapters and in simple language. And certainly no more in depth analysis of the symptoms of panic attacks to freak you out further. There’s no need, you know how you’re feeling. I just show you how to get rid of those awful feelings. Because all the other techniques require nerves of steel to follow through. I didn’t have those. Less than you think! Click below to choose from three ways to become panic free. 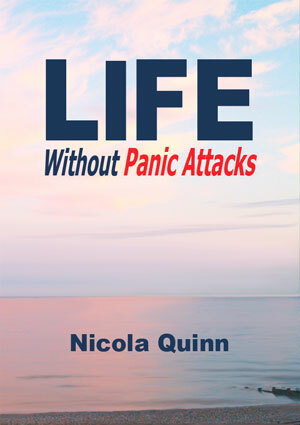 The NEW edition of Life Without Panic Attacks with ADVANCED techniques to overcome your panic and anxiety can be yours, instantly, for you to start your journey of recovery with me by your side, every step of the way, 24 hours a day. become PANIC ATTACK FREE, or your money back"
ONE: You get a BONUS REPORT on How To Help a Loved One Who Suffers From Anxiety and Panic Attacks. THREE: There's also an audio book of Life Without Panic Attacks. FOUR: You simply won't find this information anywhere else. FIVE: In the past ten years alone I have personally helped hundreds of people stop panic attacks using exactly this same technique. SIX: You get to keep everything for FREE if you are not 100% happy. Free report on How To Help a Loved One Who Suffers From Panic Attacks. An audio book of Life Without Panic Attacks. Yes Nicola! I'm fed up having no control over my life and I want to get rid of my panic attacks and anxiety for good. "I'm back in control of my life!" "After 5 years of hell I finally have my life back. And so quickly, it was almost embarrassing. I'm just angry I didn't find you sooner though I know I can tap that away too now! Thank you, thank you, thank you."